Innovation. Entrepreneurship. Leadership. Communications. They are all big trends in today’s Business Schools. But who is practising what they preach? To find out, we’ve taken a closer look at which institutions are thinking differently and leading the way when it comes to their student marketing. Here are the Business School campaigns, activities and initiatives that caught our eye. 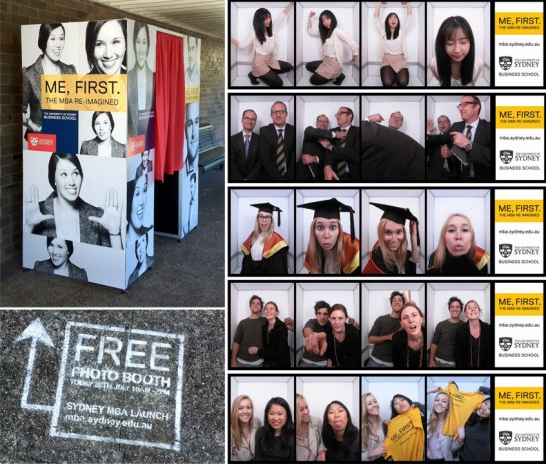 The University of Sydney Business School ‘Me, first’ multi-platform campaign is a good place to start, as it goes beyond the usual press campaign, embracing experiential marketing in the form of street chalk and a bespoke photo booth. Not the usual channels you’d expect from an MBA. But then again it fits with the mould-breaking design of the program. And it’s a bold statement of intent. The agency is rightfully proud of this creative case study. Over in South Africa, the Gap-year Certificate in Entrepreneurship and Management from the University of Stellenbosch Business School is an interesting concept in itself. It ‘helps you create your own career opportunities in life.’ And their students seized this entrepreneurial spirit to advertise the programme themselves. So, ‘stop wasting your time’ and take a look at their videos. Not for the faint-hearted! Meanwhile in the UK the Lancaster University Management School show that you don’t have to draw on pavements or dress up as a gorilla to get noticed, here’s a simple, but very real campaign. The ‘Today. Tomorrow. 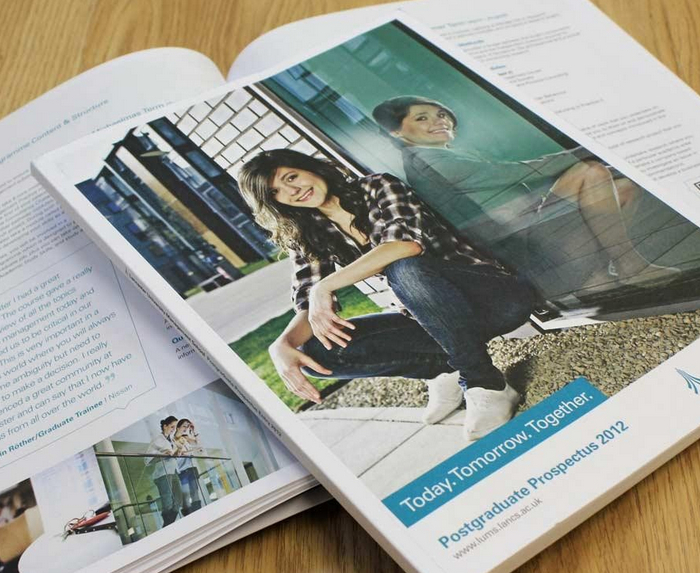 Together’ brand theme highlights the aspirations of students and has been nicely put together by Wyatt International. 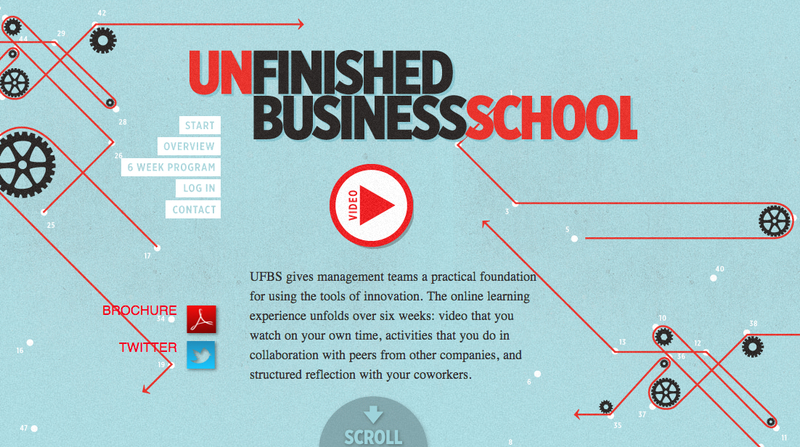 The Unfinished Business School is an exciting new development in business education. According to UFBS, the first step towards an innovation discipline is to see the future of your business as unwritten. Their courses are delivered online over six weeks. And there’s much more to their brand look than men and women in suits. It has a brave design to reflect the nature of this new and challenging school. And they use video to get their message across. As you know it takes more than a glossy brochure to connect with people these days. So, it’s refreshing to see a blog by an MBA Director aimed at current and future MBA candidates. The stories are personal, engaging and range from VW camper vans to fast fashion. Justin O’Brien, MBA Director at the Royal Holloway School of Management also has his own YouTube channel where snowball fights meet alumni inspiration and footballer Joey Barton. Take a look for yourself. Some campaigns just make you smile. 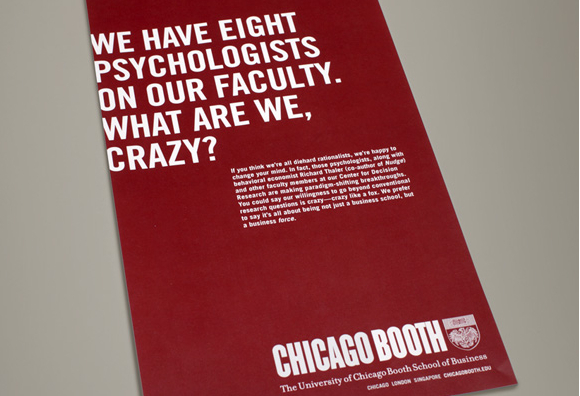 And the award-winning work from The University of Chicago Booth School of Business and Lipman Hearne is a good case study on how to market a business school. The ESSEC Business School campaign by Euro RSCG is thought provoking too. Students doing it for themselves – the best advertisement and most avid ambassadors of any business school are the students and alumni themselves. And this can work brilliantly such as this ‘One Day One Year‘ video for INSEAD. It’s authentic, heart-felt and makes you want to be there. A great advert for any university. 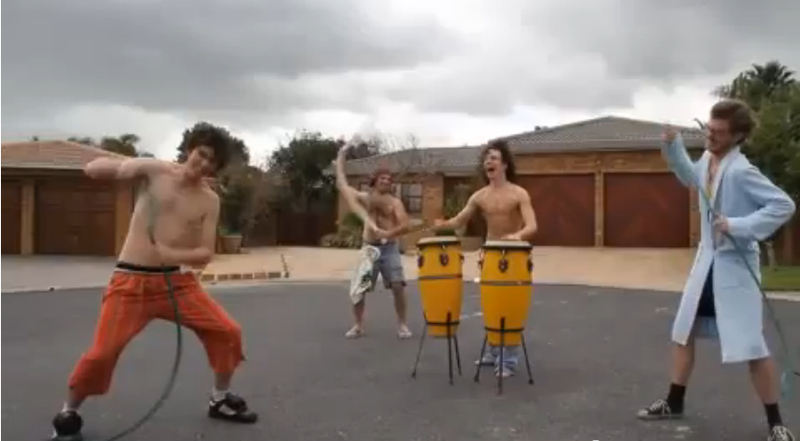 Shaken to the core – You may be sat there thinking that your students wouldn’t post such videos. Well for those of you who are blissfully aware of the Harlem Shake, this is how the phenomenon has been embraced by the great and the good taking in everyone from Oxford University to Harvard, to Columbia Business School. One of the major trends that we’ve seen develop recently is that there seem to be less high profile campaigns created by big agencies – and more social media disruption by students themselves. Business schools and the people that inhabit them are taking control of their own destinies, designing and implementing vibrant, diverse and often challenging communication strategies. And the vast majority are underpinned by three factors – authenticity, future network and long-term outcome. A sign of the times. A sign of change. And a sign that these business schools are attempting to lead their increasingly competitive markets on a global basis, while trying to cater to the needs of the individual. We’d love to hear from you on the ever changing Business School landscape – let us know your thoughts and what you’ve discovered. To find out much more about The Future Index, the HE marketing inspiration we are collecting and how it could be of use to you, please have a look at our main site. Simply click here. Also, if you are interested to hear how the Future Index Academy will be sharing the latest inspiration and trends with the brightest, most motivated, up and coming business school marketers, then email Jim directly (jim.tudor@thefutureink.com) and he’ll send you some details. An interesting perspective – thanks for sharing!